This node creates a terrain in the form of Mandelbrot set. See https://en.wikipedia.org/wiki/Mandelbrot_set for more details. To add a Slope node, right click in the Graph Editor and select Create Node > Terrain Generation > Mandelbrot. 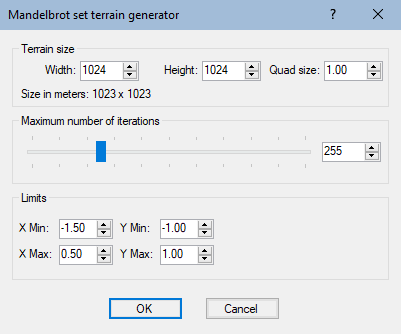 Use the slider to set the maximum number of iterations. The more iterations you add, the more detail the terrain will have. Set the X and Y ranges to be computed from the Mandelbrot set. Maximum number of iterations Maximum number of iterations to perform. The height of a vertex equals the number of iterations needed to exceed the norm 2.